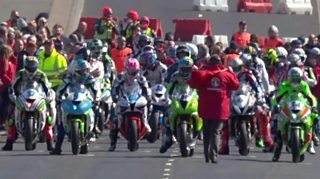 Watch highlights from Tuesday's opening practice session at the North West 200 where Alistair Seeley led the way in the Supersport class (114.722) ahead of Dean Harrison and Lee Johnston. Jessopp topped the Supertwins session with a best lap of 108.91 which left him ahead of Rutter (108.30) and Ivan Lintin (107.88), as Lee Johnston, Dan Cooper and James Cowton completed the top six. In the final Superstock session, Seeley was pipped for provisional pole as Michael Rutter produced the fastest time of the day with Lee Johnston third fastest and Ian Hutchinson next best.